I heard about people watching Better Call Saul and never watching BB. You might be able to since its 27 years later its night like they can just reset everything but I'm guessing it will be way better seeing everything. I could see watching just BCS or BB. But you either want to absorb all Lynch or you don't. If you like the remake, I'm sure you will be kicking yourself for not watching the original with all this time you had available to. Or you'll hate the remake and just wish you never even heard of the show. Oh I thought this was just a remake, not a continuation. Thanks. Season 1 obtained. Let's go! And Better Call Saul takes place before BB. Wow 18 episodes. Will they be 45 minutes? At first they said 9 episodes, so they might go for a 30 minutes format. Last edited by Morphismus; 05-28-2016 at 05:46 PM. This is the most excited I've ever been for a tv show. Well, I guess the anticipation leading up to the Breaking Bad finale comes close. Probably the same as any cable drama where they're close to an hour. 9 episodes was the first announcement and it later turned out that part of the negotiation was to get more episodes. I keep thinking about how true to the real world in the present day it will be. Will they pretend that smartphones don't exist or not? It's impossible to think of Twin Peaks actually taking place in 2017, but they've been adamant about time having progressed 25 years, and it sure was ~1990 in the original episodes. What do you guys think? Will they have iphones? Will Trump be president? Will Dale Cooper's instagram account be full of selfies of him showing as Bob? Either way, I'm pumped as hell. Okay, I just had my mind blown by this theory that Mulholland Drive is a Twin Peaks story. Naomi Watts, Sheryl Lee, and Phoebe Augustine are all in the cast (of the new TP), as is Robert Forster, who has a small role as a detective in Mulholland Drive. The roles of Watts and Forster are yet unknown by name, but we do know Forster is playing a cop. We also know — and this is really tantalizing — that there was some filming for season three done in an exclusive Parisian club conceived and co-owned by David Lynch. Know what that club is called? Do I even have to tell you? It’s called Silencio. Sick find, my mind is blown. 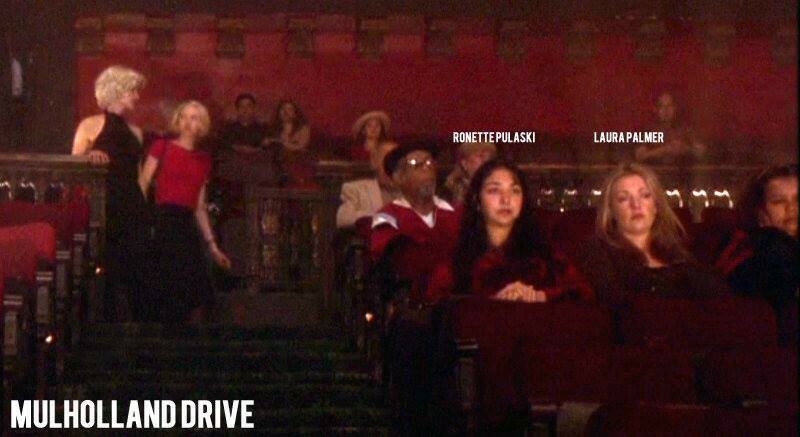 So we all should rewatch Mulholland Drive? Bro... Ive seen Mulholland Drive at least 30-35 times, its truly one of my favorite movies of all time because it happens to be one of the saddest movies ever made... Ive never noticed Laura and Donna in that scene... NEVER. It's Laura and Phoebe...but yeah, I've seen it over 10 times...never saw it before, either. Crazy. I didnt watch the entire video when you first posted the link... but that is not from the movie, where is it from? What do you mean? It's the Club Silencio scene from MD. There was a recent article in Vanity Fair about how Lynch originally planned MD as a literal spinoff of TP, scheduled to premeire while season 3 of TP aired (which of course never happened) so they scrapped MD as well. Then a few years later Lynch decided to go ahead with MD anyway. It's an interesting analysis of MD and the casting of Harring and Watts. If anyone wants a link to a pdf download, pm me. I thought it looked a little weird, but I just checked... its legit as per my criterion disc. Mulholland Drive is almost certainly one of the 3 movies I've seen the most times in my life, I was obsessed with the movie around the time it came out, and I was also a huge Twin Peaks fan already. And I never ever ever spotted Laura and Ronette either, despite the fact that I already knew at the time that MD was supposed to be a tv show / possibly some sort of Twin Peaks sequel. Feels really insane, Laura looks exactly like Laura as well. Oh man I'm so incredibly pumped for the upcoming show.